All athletes face challenges. For a marathoner, it could be the physical pain of shin splints or mustering the motivation to slip on those running shoes each morning. But athletes with diabetes face challenges that are unique to their disease—and that they must continually manage to prevent what can swiftly turn to critical and life-threatening consequences of hypoglycemia or hyperglycemia. Glucose levels can fluctuate based on several exercise or competition aspects, including exercise type, intensity, and duration; time of day; emotional state; environmental conditions; and absorption rates of insulin and food. Add to that the frustrating reality that no two people with diabetes will react the same to any combination of these factors, and you begin to realize the unremitting actuality that athletes with diabetes face in the pursuit of their performance best. Circumstances change often in the world of sports, where winning is the end goal, not glucose control. But fortunately for athletes with diabetes, technological advancements of the past few decades are allowing them to level the playing field to a point where they can focus more on succeeding in their sport while simultaneously triumphing over their disease. Matt Corcoran, MD, CDE, an endocrinologist and president and CEO of Diabetes Training Camp, explains that for someone without diabetes, the body regulates its own fuel metabolism, allowing for both efficient and effective exercise naturally. Yet “exercisers and athletes [with diabetes] have to manage their own fuel supply, and the main way that they do it is either by regulating their insulin supply and/or nutrition supply,” he says. “And things can change rapidly, on a minute-to-minute basis,” he adds. “It’s a much more complicated, erratic system for someone with type 1 diabetes than it will be for most people with type 2 diabetes” who aren’t insulin dependent. Corcoran notes that he’s seen more psychological and behavioral issues in people with type 2 diabetes, so simply getting some of these patients to participate in physical activity is sometimes the biggest challenge. But, physically, people with type 2 diabetes who aren’t insulin dependent won’t “have the kind of flux in terms of their glucose control that somebody with type 1 diabetes will have,” he says. The past few decades have witnessed the introduction of new insulins, medications, and technologies for diabetes treatment. These positive developments have undoubtedly aided diabetes management overall, but athletes with diabetes are doubly benefiting because better-managed diabetes off the court allows for better performance on the court. “Two decades ago, diabetic athletes had access to a limited number of blood glucose meters, and they were bigger, slower to give a reading, and much more expensive. Also, the types of insulins available were limited, and most were harder to adjust doses of to compensate for physical activity,” says Colberg. While 20 years ago people with diabetes had to change their lifestyle to match the time action of their insulin, today’s insulins—and technologies—are prescribed to match an individual’s lifestyle, explains Brown-Riggs. According to Colberg, the advancement with the most influence has been the wide availability and affordability of blood glucose meters. “The reason they have had such a large impact is that they are tools that allow athletes to know what their blood glucose levels are at any time point,” she says. “Prior to the 1980s, when these first became more widely available, an athlete would have to exercise without having a clue of what his/her blood sugar was. Most athletes find that their blood sugar needs to be between 80 and 180 mg/dL for them to perform optimally. So if they were [at] 250 [mg/dL] and had no way of knowing or adjusting for it, their performance likely suffered. They also had to worry more about getting unanticipated low blood sugars,” she explains. The effort and inconvenience of monitoring blood glucose prior to the advent of glucose meters, while easily overlooked today, should not be understated, according to Corcoran. Before meters, people with diabetes used to determine glucose levels by first collecting a urine sample, then dropping a tablet in the sample before discerning what color it turned—not exactly clear or convenient. “So there wasn’t a way to have constant monitoring of what the glucose levels were doing,” says Corcoran, adding that the insulins of that time put people at risk for very wide fluctuations in glucose levels. “You don’t need to be a chemist to get a blood glucose reading,” Brown-Riggs says of today’s technology, adding that glucose meters also provide more reliable results. CGM systems have been another important tool for athletes who wish to compete in sports without having to worry about what will happen to their glucose levels, according to Amy Hess Fischl, MS, RD, LDN, BC-ADM, CDE, program coordinator for the Teen and Adolescent Diabetes Transition Program at the University of Chicago’s Kovler Diabetes Center. CGM devices have three components: a receiver, transmitter, and sensor. The sensor is inserted beneath a patient’s skin, while a wire reads the amount of glucose in the fluid under the skin. The transmitter is then attached to the sensor and transmits the information to a receiver, which resembles an oversized pager, on which the user reads the glucose level. These devices give glucose readings roughly every five minutes. “During exercise they can be used to monitor glucose trends, although they are not as effective at picking up hypoglycemia, given their 10- to 20-minute time lag behind actual blood glucose levels,” says Colberg. “This device does not give a blood glucose reading, since it is reading the amount of glucose that is in the fluid under the skin,” explains Hess Fischl. Weiss notes that CGM systems are meant to be an educational tool showing trends but can also be used as an alert mechanism, especially during exercise. CGM alarm capabilities can alert patients when their glucose levels are outside a preset range, which can be imperative for athletes with diabetes, whose levels can change quickly while exercising. With intermediate-acting insulins of the past having the capacity to drop blood sugars, an exercising athlete’s blood sugar could fall without the individual being aware, leaving the athlete to deal with a rather profound low blood sugar and the correlating consequences—not the least of which, to an athlete, relates to the immediate abandon of the athletic endeavor. “So the sensing is really important in that it allows us to understand how to manipulate an insulin pump or basal insulin in order to prevent either very low or very high blood sugars,” explains Weiss. “Now, by using continuous glucose monitoring systems, patients can watch the trend of their blood sugar and make adjustments in their consumption of sugar in order to prevent any kind of profound hypoglycemic events,” he adds. Another advance that has eased difficulties for athletes with diabetes is insulin pumps, according to Colberg. “Since basal insulin rates on them can be adjusted down during exercise, they allow athletes to create a more ‘normal’ physiological response to activity, which is a lowering of insulin levels during exercise. They can also adjust basal insulin doses postexercise to more effectively prevent later-onset hypoglycemia,” she says. Insulin pumps deliver either rapid- or short-acting insulin through a catheter placed under the skin, and they “allow for people to change their insulin-dosing strategy on a minute-to-minute or hour-to-hour basis, so it allows for much more precise insulin dosing—and precision is key when you’re talking about dosing insulin for participation in exercise or sports,” says Corcoran. Pumps also allow athletes with a steady blood sugar prior to exercise who will be spending an extended amount of time being active to set up a temporary infusion rate that’s lower than the usual insulin infusion rate, reducing the likelihood of experiencing hypoglycemia, Corcoran explains. Several different insulin pumps are currently on the market, although all do basically the same thing in different ways, says Weiss. “There are pumps that have programmable capacities that are different from others. There’s the pump without tubing [the OmniPod]. There’s a couple more podlike devices that are coming out without tubing and wiring. There are also devices that will incorporate both pumping and sensing, and there’s a lot of those in development. For the athlete, that’s really the best way to go,” says Weiss, who notes that athletes benefit greatly from using a CGM and an insulin pump together. Diabetes treatments and technologies are constantly evolving. And while the technologies available today are leaps and bounds ahead of those that existed 15 years ago, “there is always room for improvement,” says Hess Fischl. Regarding what’s on the horizon for diabetes treatment, she says researchers have been working for quite some time on various noninvasive devices to measure blood glucose levels, with one potentially offering athletes a way to get even more precise feedback on blood glucose levels at any given time. Some experts look forward to the day that insulin pumps are developed to be used in a “closed-loop” system that will work much like an actual pancreas. However, Colberg believes it might be more beneficial for athletes with diabetes if researchers were to figure out a way to harness the immune system and regenerate beta cells naturally. But Colberg notes that the biggest challenge for athletes with diabetes (and her highest hope for a technological “cure”) relates to the lack of information currently known about the whys and hows of glucose fluctuations—”that maintaining blood glucose levels requires some knowledge of anticipated responses and some guesswork when making regimen changes. If the guesswork can be removed with a computer algorithm that anticipates changes more effectively at some point, fewer athletes would have to contend with hypoglycemia or hyperglycemia affecting their performance during exercise,” she says. As an advanced practice RD who works daily with patients who have diabetes, Hess Fischl advocates for RDs getting involved in the training of all technology devices. “Scope of practice and protocols set in place throughout the country vary, but the only thing that is beyond our scope is actually piercing a person’s skin. It is well within all RDs’ scope of practice to train individuals on these devices,” she says, noting that RDs are in a unique position when it comes to working with patients with diabetes. “Given that we are the experts when it comes to meal planning, it is very easy for us to help the athlete integrate all components of their care and help them understand how it all fits together. RDs should be proactive and contact the technology companies to stay abreast with what is available and get trained on all the devices. The American Dietetic Association has many practice groups, but the Diabetes Care and Education practice group has a technology task force that helps people get the information they need about the technologies,” she says. 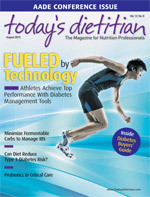 Brown-Riggs says dietitians should spread the message that with proper education and planning, people with diabetes can live an active life and compete successfully in any sport. “I always tell my patients [that] no one wants a diagnosis of diabetes. But if you have to have it, now is a good time because we know so much more today in terms of treatment and management,” she says. One example of how athletes are overcoming diabetes-related challenges with the help of technology is Charlie Kimball, the only licensed driver in the Indy Racing League with diabetes. Although currently ranked second in the points standing and projected to vie for the 2010 Indy Lights championship, Kimball was sidelined three years ago after being diagnosed with type 1 diabetes at a routine physician’s visit. With no family history or previous knowledge of the disease, Kimball thought his dream of being a professional racecar driver might go unrealized. But after a little strategizing with his doctor, along with a helping of soul searching, Kimball got back in the racecar and never looked back. Kimball quickly realized that racecar driving presented special challenges. “Unlike other sports, [such as] baseball, basketball, or soccer, I can’t call time-out and check my blood sugar during a race. Once the green flag flies, I’ve got to be fully prepared, fully committed, ready to race, hammer and tongs … for 100 miles … at full tilt against guys that if I said, ‘Hey, can you hold on, I need a snack,’ they’d just laugh at me,” explains Kimball. Thankfully, Kimball has the help of technology to aid his diabetes management while driving. First, he wears a continuous glucose monitor that is attached with Velcro to the steering wheel, so his blood sugar level is displayed on the dashboard along with the car’s water temperature, speed, and oil pressure data. “It’s a separate display, but it’s right there as part of the car body data display, so I know what my blood sugar is,” Kimball says. While driving, he also sports a special helmet system that enables him to take a sip of orange juice if his blood sugar levels get too low—without lifting a finger. “There’s a bottle up in the front of the car that I fill with orange juice and the tube runs up and plugs into a tube in my helmet so that when I’m driving, if an alarm on my CGM goes off and shows my blood sugar is getting low, I can drink that orange juice and bring it up so that I don’t have to stop,” he explains. And while traveling for races and other events, Kimball takes insulin using an on-the-go pen device to keep his glucose levels in check. “There are lots of different challenges thrown at me, and having the ability and the flexibility of the Levemir FlexPen to be able to inject myself on the go really helps me,” he says. Kimball is a big proponent that diabetes shouldn’t close any doors to athletic potential. “I am a better athlete because of diabetes rather than despite it,” he says. “There were definitely times when I thought I wouldn’t be back into a racecar. And so now when I am, I appreciate it that much more and each success is that much sweeter.